If you need to furnish or refurbish an office on a tight budget, then you have found the solution that will allow you to create a great looking and well equipped office at a fraction of the costs of new furniture. Not only will your new furniture look fantastic but it will be stylish and functional. We buy furniture at huge discounts and pass those savings on to our customers so you will be able to buy everything you need at a fraction of the normal retail costs. 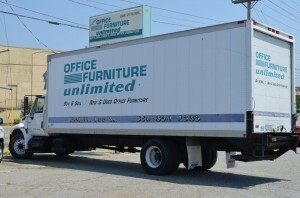 At Office Furniture Unlimited, we provide used office furniture, which is top-notch brand-name furniture. We assure complete satisfaction with our used furniture. You can visit our spacious showroom of used office furniture in Greensboro where you will be able to peruse hundreds of pieces of furniture, including desks, chairs, tables, credenzas and filing cabinets. Our huge showroom and warehouse of used office furniture is just a short drive from Winston-Salem and High Point and will allow you to see a great variety of used furniture. Why should you choose our used furniture? Our gently used furniture is quality made and in great working condition. Any minor scratches or other signs of wear are repaired by our professional staff. We clean and re-polish the used furniture with great care, prior displaying it in our showrooms or delivering it to the customer’s office or residence. Our used furniture in many cases looks brand new. We have all these features in our used office furniture selection. You can visit our showroom of used office furniture in High Point’s neighbor Greensboro in order to choose just the right furniture to completely renew your office or entire company for just a fraction of the cost of new furniture. In many cases we are able to save our clients 80% over other furniture suppliers. If you’ve looked at furniture prices lately and have been discouraged, then come check out our 40,000 square foot showroom and see how much we can save you. Our huge selection of used office furniture will certainly have just what you need. We host a wide range of furniture products other than used office furniture. We do offer new office furniture and can deliver and set it up for a very modest fee. We provide used desks and chairs and filing cabinets as well as new and brand-name office furniture. We offer discount office furniture, which is priced well below retail value. Our office chairs, desks, cabinets, cubicles are in excellent condition with great color and finish selections as well.